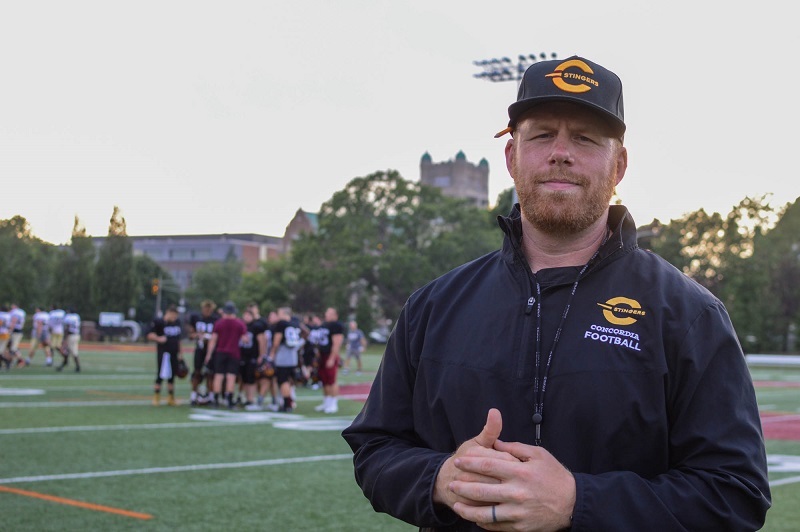 Brad Collinson, 39, was named the new Concordia Stingers football head coach in June 2018. However, the coach’s return to Concordia is just another chapter in his long football career. “It was always a personal goal of mine to be the coach at Concordia,” Collinson said. A St-Bruno native, Collinson, began his football career as a kid, under the guidance of his father who played football as well. Collinson described his younger self as a big kid who played many sports before settling on football. The first big step in his football career was becoming a member of the Vanier Cheetahs football team in 1996. During his time at Vanier, he was scouted by National Collegiate Athletics Association (NCAA) teams in the United States, and by Canadian universities. He accepted a scholarship for the University of Tennessee at Martin after graduating with a diploma in communications in 1998, but that didn’t last long. Once he returned to Quebec in 2000, he joined the Concordia Stingers football team. Playing as a centre and long snapper, Collinson was named captain early on during his time with the team, and established himself as a leader both on and off the field. That hasn’t changed since, according to some of his current players, who describe him as strong and tough, but fair. Collinson was then signed as a free agent by the Montreal Alouettes in the Canadian Football League (CFL) and started every game during the 2003 season. The Alouettes won the East Division and made it to the Grey Cup, ultimately losing to the Edmonton Eskimos that year. That stellar season would end up being his first and last as a CFL player. “Unfortunately, it wasn’t my choice to step away when I got released after training camp in 2004,” Collinson said about leaving the Alouettes. He went back to Concordia to finish his degree and became a part-time staff member for the football team, as he would be unable to rejoin the Stingers as a player due to his year in the CFL. Collinson received his degree in leisure science in 2005. The Stingers went 3-4 last season and lost in the first round of the playoffs. Archive photo by Alex Hutchins. In 2010, Collinson stepped away from Concordia and moved onto head-coaching jobs for U18 Team Canada and Team Quebec. He was also an assistant coach with the Université de Laval Rouge et Or, and during his time, they played in six Vanier Cups and won four. Most football coaches at the professional and collegiate level have played the sport at some point. Collinson made that transition long ago with success as an assistant coach and expects his past will help in excelling the program. Collinson has no aspirations to coach in the CFL, so his aim and focus remain strictly on the job and what he is doing at Concordia. The head coach added that the Stingers are giving the players resources to develop on and off the field. He said his main focus will be making sure his players graduate. Collinson brings a lot of experience and knowledge to the Concordia Stingers football team that could help them this coming season. With his background as a player and an assistant coach, he understands what it would take to turn this young Stingers team into a winning one. The Stingers will be seeking their first Vanier Cup appearance since 1998, and the team’s first victory in its history. “We always have the goal to win the Vanier Cup, and if we don’t believe that, it’ll never happen,” Collinson added.